I couldn't decide what Thing 5 was going to be. Whether it was going to be about disciplining them which we're doing much more of, about Evan having a viral infection (which he is over), his fall (which left him with a big bump) or about Jordan's penchant for soft toys and having to dig Strawberry Shortcake's hair out of her mouth. Then I realised, thinking about all these things were moot because I haven't had time to blog because I've been so busy with them because of the aforementioned situations which I shall reiterate. I was very distressed that the Boy's been sick so much in the last two months. And this time the fever went on for 3 nights. 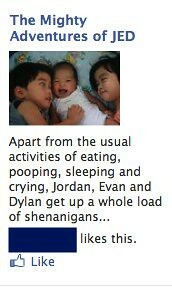 The paeds, my doctor brother and some mommy friends assured me that it was normal that he's getting sick so much. It wasn't much assurance but at least I knew there wasn't something seriously wrong with him. Apparently, round about 6 months or so, babies lose their immunity. Up till that point, their immune system is mine. And then they start from scratch and have to build it up again. So, at the age of one or so, when they're likely to be exposed to the world more, they catch all sorts of things. When I asked the doctor how we could prevent it, he looked at me point blank and told me that I didn't want to do that unless I intended on bubble-wrapping him his whole life. Now that's a thought. I must have forgotten all that because I remember reading about it somewhere. Perhaps in the midst of trying to deal with the sick child, the rational, intellectual mind disappears. In fact, I'm sure it does. 2. Evan getting a bump. Packrat hardly ever rings me at work. And one day last week, I miss a call from him and then a cryptic message about Evan bumping his head. 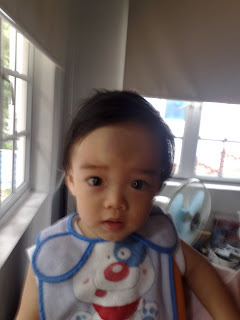 The seriousness did not register till I got home and saw the bump on his forehead the size of an egg. Having been out of action for a few days, the boy mustn't have been very stable on his feet. Everyone was commenting how he was walking like a drunken sailor in diapers. I should have put two and two together and warned his minders that the boy was likely to be less coordinated than usual. A split second of Aunty D looking away saw his forehead and the corner of a painting connect in the most painful of manners that led to much screaming and then swelling. After icing his bump, it still looked like an egg was forming right in the middle of his forehead. The poor boy. He's been clingy and whiny since. As well as somewhat reluctant to be put down. I think he knows he's not so good at the coordination now and didn't want to risk being hurt again. This was evident with the times he would be walking, suddenly end up in a sitting position and just roll onto his back. If I didn't know he was ill, I'd think it a completely fluid movement from standing to lying with no breaks in between. When Jordan was born, there were people who preferred her brother to her because she had quite a temper, did not have her brother's puppy dog eyes and basically had a mind of her own. She still has most of these characteristics except she's mellowed. She's become much friendlier, sociable, animated and extremely affectionate. 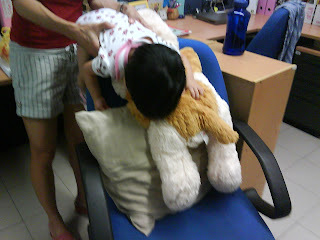 She's learnt how to hug and kiss people, nuzzle her brother when he is upset and has a big thing for soft toys. And she has a thing for big soft toys. I have a stuffed pig, given to me by some ex-students. It's larger than she is, size wise, but loves to cuddle up to it, lie on it and bury her face into it. We thought it was just the stuffed pig but apparently, it's any Big, Soft toy. Even when it's a toy that she's never seen before and belongs to a stranger. And today, she was even able to play act with her own little soft toy, a pink flannel bear that she carries around. While she was holding on to it in the car, we told her to pat it and make her teddy bear sleep and she pat the bear on its bum like we do with her and hugged it tight, like we do with her. The problem is that her love knows no bounds and she doesn't realise that eating the object of her affection isn't really an acceptable way of showing love. Her Strawberry Shortcake doll has got the same post-natal hair drop as Mommy does. Not so much because of hormones but because they get yanked out and chewed on by Baby J. Occasionally, both of them do that to us as well, but I think that's second choice. At least dolls don't yelp and struggle when they are chomped down upon. Becoming more cognizant means exploration and discovery. The problem with discovery and exploration means encountering things that might be dangerous to them. For me, that means being able to give them enough room to find out new things about their surroundings but reigning them in so that they don't get hurt in the process. It's a fine line to tow and I'm not sure how else to do it apart from an often imperious sounding "no". So much so that it is often met with a down turned mouth that very rapidly dissolves into a puddle of wailing tears. Packrat has also taken a more active role in disciplining them. Issuing the "no" warning that is often followed by a smack on the wrist because the little ones don't think we mean business. Once again, it is met by tears. I am often faced with the conundrum of whether to ignore the tears or comfort the child while explaining I'm not angry with the child, just with the action of the child. So it has begun, parents as the bad guys. Grandparents and Aunty D to run to when Mommy or Daddy get that glint in the eyes. Because there is all this as well as work and general living, blogging becomes a low priority activity, even if it is to record why I am a good mom. I'd rather be out there trying to be a good mom then spending all my time in front of the computer writing about it and feeling so pleased about it.